Fargo Peaks, or, How I Learned to Stop Worrying and Enjoy the Ride – Dork Forty! One of the things Twin Peaks has going for it is the shock of the new. That might seem odd for a show that’s coming back after a 26-year hiatus, but it’s true. 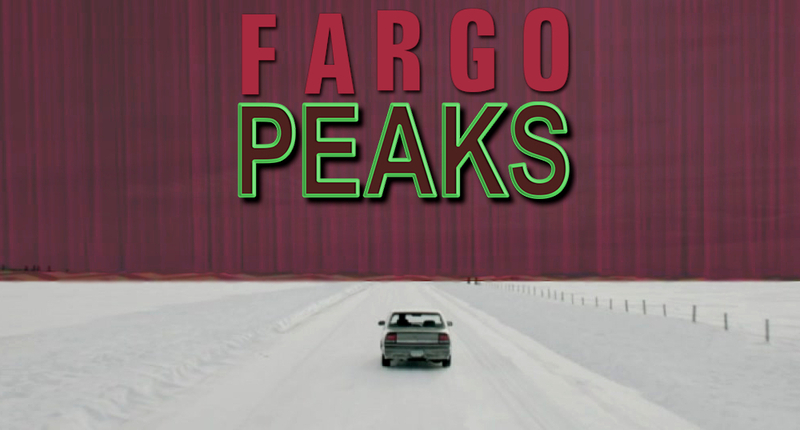 Fargo started a full month before Twin Peaks, and it’s been a slow burn. Now I happen to like a good slow burn, but something seemed off with this season at first. It was well-written. It was well-acted. I was enjoying it. But something didn’t quite gel. I didn’t feel the immediate attachment to the cast that I usually do. I came to feel it over time. But I didn’t feel it at first, and that threw me. So one month in, when my favorite TV show of all time returned… It was easy for me to lose track of Fargo. And to be fair, that Twin Peaks premiere was dynamite. Scary and funny and weird, launching tons of different plotlines in multiple locations around the country and immediately picking up the threads I’d been waiting so very long to see resolved. I watched it twice the first night, and once or twice more over the following week. 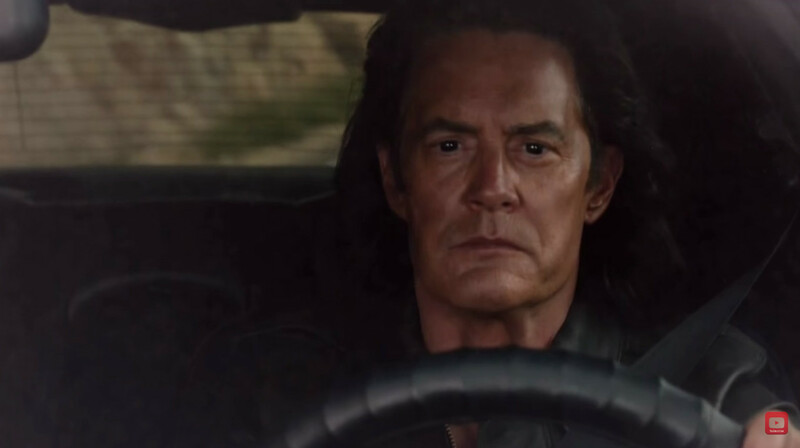 I participated in podcast discussions, and pored over conversation online as the community of Twin Peaks fans got to work applying a quarter-century’s worth of obsession to those two hours of television in a frenzy of excitement. But I let that week’s Fargo sit unwatched on my DVR until the next one had aired. By then, I had seen all four released hours of Twin Peaks two or three times, and was ready for a break. Granted, that’s still a testament to how much I like Fargo: normally, I would have just listened to music or read a book. But I really wanted to see it, so I turned the TV back on instead. And then something clicked. All the plot and theme and narrative experimentation the show had been engaging in from episode one came together for me, and I was back on track. What had changed? Not the show. It was still moving ahead at the same deliberate pace. But I think I’d gotten lazy, watching it week to week without taking larger concerns into account. 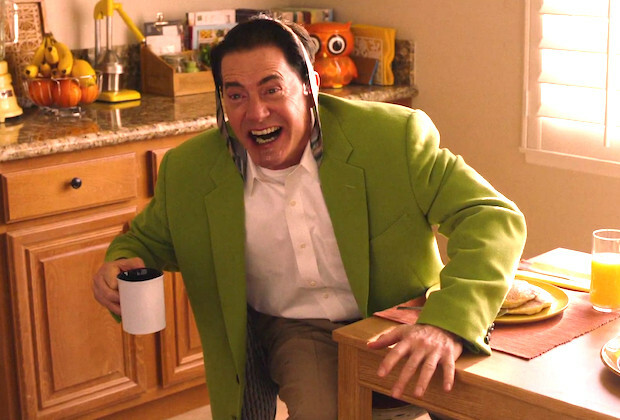 And the experience of Twin Peaks woke me up to just how good Fargo really is. Because Twin Peaks is a mystery. It encourages analysis. And it’s not just the mystery of “Who killed Laura Palmer?” anymore. The cat’s 25 years out of the bag on that one. So this season introduces a multitude of new mysteries. How wide does the criminal web of Dale Cooper’s evil twin (aka Evil Coop) really stretch? 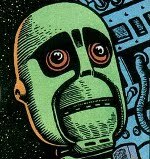 What was that thing in the glass box back in episode one? Who was on the phone when Evil Coop tried to call Philip Jeffries? Is he the one who put the price on Evil Coop’s head? And why didn’t Jeffries himself pick up? Was Bill Hastings possessed, and what information does his secretary have that’s so important? What bad business is going on at the Lucky 7 Insurance Company? Did Evil Coop put the hit out on Dougie? Why can’t Regular Coop wake up? How did those photographs get into Mr. Todd’s safe? What happened to that black box in Argentina? Who are Richard and Linda, and why are they important? And on and on. We’re six hours into this show, and there’s ten million mysteries all at once! Even more than all that, though, Twin Peaks is a mystery about the very nature of mystery itself. It deals in grand questions that have no easy answers, questions about human nature, about the evil lurking inside good people. And that is something it very much has in common with Fargo. …whose sibling rivalry gets completely out of hand. Ray lets his jealousy over Emmit’s financial success drive him to theft and, eventually, murder. Emmit, meanwhile, because his financial success isn’t so great as he’d have you believe, takes out a loan from the wrong people, and finds himself knee-deep in a money laundering scheme. Events escalate from there. Lives are ruined, blood is spilled, and both brothers prove themselves lesser men than they think they are. …a respectable small-town lawyer, and just about the nicest guy you could ever want to meet. 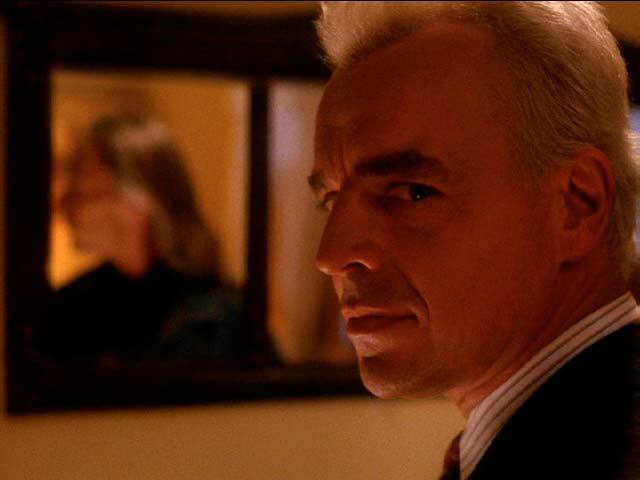 But Leland Palmer was haunted by demons. Literally. 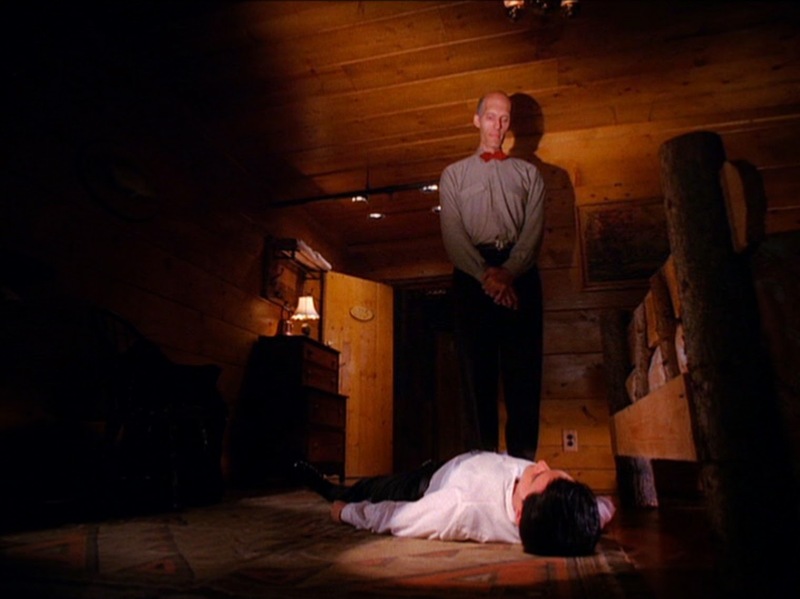 Because Leland was possessed by BOB (that’s him in the mirror up above), a murderous spirit from a place called the Black Lodge. But here’s the thing: BOB looks just like Mr. Robertson, a neighbor who molested Leland when he was a boy. So is BOB an ancient demonic force, or is he just a face Leland put on a part of himself that he couldn’t accept? The show leaves that question open, but personally… I think he’s both. BOB represents the cycle of abuse, a human evil that existed long before Leland Palmer was molested. But he didn’t cause Leland’s evil. Not entirely. Leland had to let him in. And once he had, it’s entirely possible that Leland gave him a new face, leaving his own personal psychic mark on something far older than himself. But that was all a quarter-century ago. The new season gives us a new kind of demon: the afore-mentioned Evil Coop. He also comes from the Black Lodge, a place where souls are weighed and tested (and sometimes eaten). If you ever enter, you’ll be faced with your Shadow Self, a living embodiment of all your worst qualities. If you defeat him, you will emerge enlightened. If you don’t… He takes your place in the world, while you’re imprisoned in a very stylish purgatory. That’s what happened to Our Hero, FBI Special Agent Dale Cooper (that’s him on the left). He’s been trapped in the Lodge for 25 years, and now his sentence is up. He’s back in the world, and must face his doppelganger once again. And this time, only one of them can survive. I tend to view this season’s demonic eruption even more metaphorically than I did the Leland/BOB connection. This idea of confronting your own worst nature is something a lot of people have to do eventually, and how they handle it determines how they’ll live the rest of their lives. Some improve themselves, while others decline (or, you know, become even bigger assholes than they were before). It’s an internal struggle made external, a metaphor for enlightenment in defiance of personal demons. …an international criminal financier who’s slowly taking over Emmit’s business interests for himself. Varga’s a marvelous creation, simultaneously grand and banal, menacing and seedy. But mostly menacing. 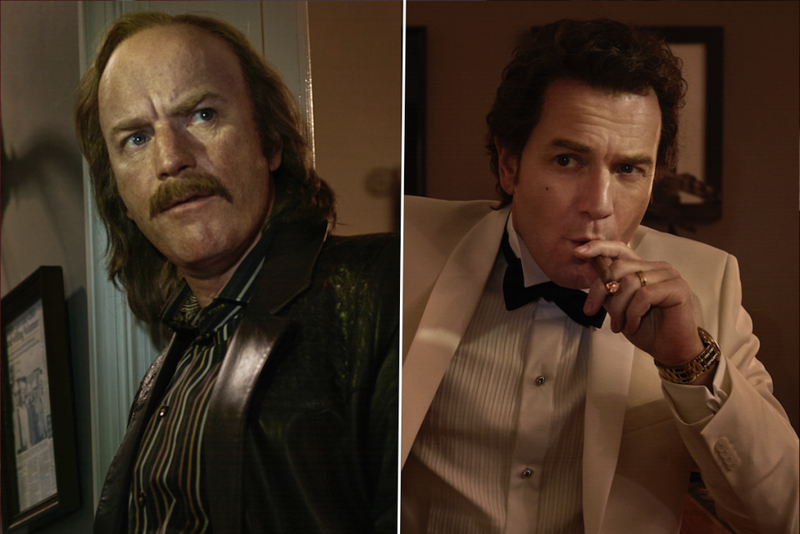 Fargo showrunner Noah Hawley excels at creating these terrifying people. Every season has featured at least one character whose presence makes you afraid (genuinely, gut-level afraid) for the safety of everyone they meet. Varga’s a little different than the others, though, because he never personally raises a hand in violence (he has associates for that). What makes Varga so terrifying is how very persuasive he is. He has a habit of confusing people with historical anecdotes or strange words from foreign tongues. It’s a trick he uses to put people off-balance, making them feel dumb, then explaining things in a way that makes him seem far smarter than them. Some of the things he says are true, but just enough of them aren’t that you’re never quite sure what’s going on. But that doesn’t matter. Because once you think he’s smarter than you, it’s far easier for him to convince you that whatever horrible thing he’s trying to talk you into is correct, unavoidable, and even for your own good. He does this especially to Emmit, who (even though he’s obviously scared shitless of the man) slowly starts to fall for Varga’s bleak, Darwinist view of social economics. Emmit is, as he says himself, a good man. When he sees someone in need, he reaches out. He helps. He’s nice. People like him. Really, genuinely like him. You can see that with his secretaries, and the casually pleasant atmosphere of his office. But as Varga insinuates himself into the business, laundering millions of dollars, and as Emmit does nothing to prevent it, he starts to crack. He starts to see things the way Varga sees them, and that may lead to his own ruination. So in his own way, Varga’s just as demonic, and just as influential, as BOB. He’s just more grounded. But that’s really just a metaphysical explanation for plain old everyday human cruelty. You don’t get much more grounded than that. This is not to say that Fargo doesn’t try to be more than just a very entertaining crime story. Noah Hawley is not afraid of taking literary chances. There’s one episode this season built around Peter and the Wolf, for example, and another featuring excerpts from a science fiction novel that becomes a heartbreaking metaphor for the futility strangling the life out of this season’s hero, Police Chief Gloria Burgle. But more to the point, Fargo gets metaphysical sometimes, too. 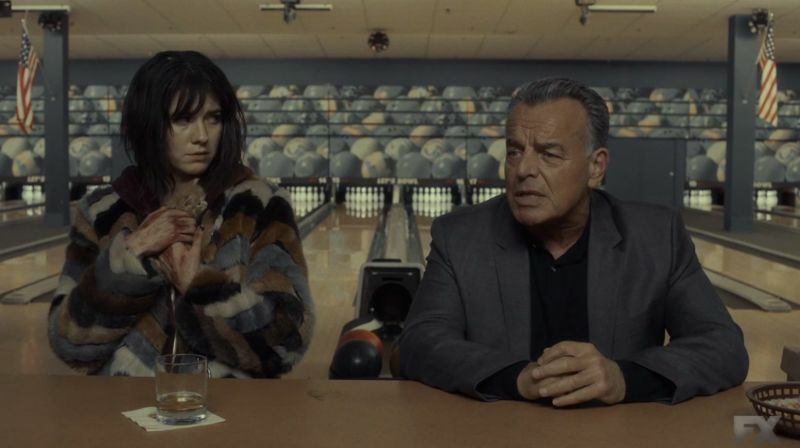 That’s Nikki Swango (Mary Elizabeth Winstead) meeting Ray Wise in a bowling alley. Nikki is Ray Stussy’s ex-con girlfriend, who encourages Ray in his feud with Emmit. It’s unclear for most of the season whether Nikki really loves Ray, or if she’s using him, or… if she’s just a dangerous crazy person who’s messing up the poor schmuck’s life. Whatever the case may be, Nikki’s a force of nature, and a lot of fun to watch. But as you may have figured from her disheveled appearance (and the handcuffs), things don’t go entirely smoothly for Ms. Swango this season. She winds up on the run through the Minnesota wilderness, being chased by assassins, and clambers up over the crest of a hill to find the world’s most isolated bowling alley. A bowling alley so isolated that its very existence seems impossible. 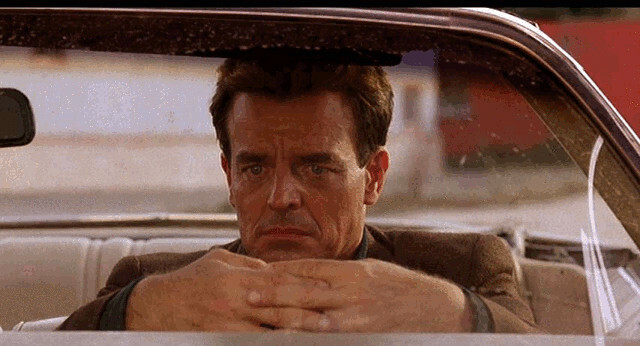 That’s okay, though, because when she goes in, as I said… She meets Ray Wise. Technically, he’s playing Paul Marrane, a traveling businessman who we’d already met earlier in the season, when he gave Chief Burgle some very good advice on an ill-advised investigatory side-trip to Los Angeles. Marrane’s good at giving advice. He’s full of stories and interesting linguistic trivia. Much like Varga. Except that Marrane’s stories are all true. And he uses them to enrich the lives of the people he meets, rather than his own (he’s also not nearly as condescending). So if Varga’s a demon, Marrane must be… an angel? So, yeah. 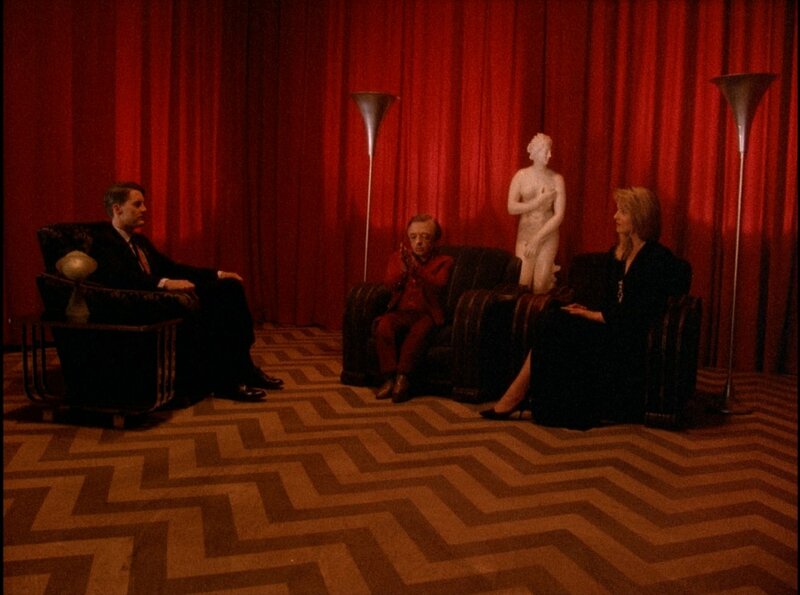 Maybe it’s NOT such a stretch to think that you could drive yourself down one of those snow-covered Fargo highways and find yourself in the Black Lodge. Except that in Fargo, it would be a lot less obviously not real. 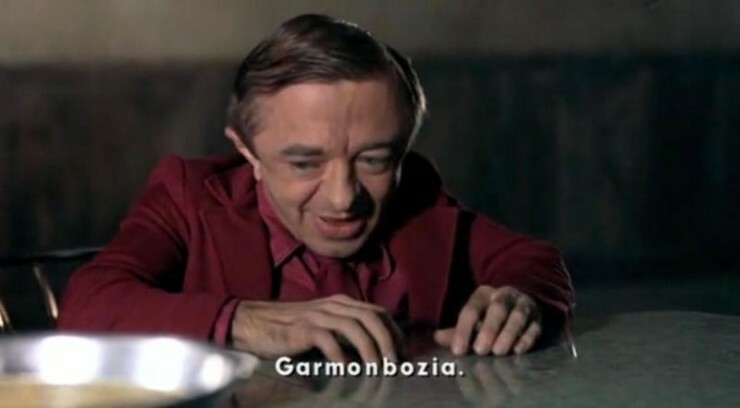 And that’s why Twin Peaks lingers in my mind so much longer: Fargo, even when it delves into the supernatural, ultimately makes sense in the way that stories make sense. I watch it, enjoy it, and admire the skill behind it. It entertains and gives me things to think about. But they’re things I can make sense of logically. Twin Peaks, on the other hand, demands interpretation. It presents surreal imagery and dream-logic storytelling, strange events that are entertaining, but don’t make literal sense on first viewing. They worm their way into my subconscious, haunting me in the most pleasant manner possible. And over time, after sleeping on it, sense emerges. I’m not talking about every scene or every line of dialogue here. Twin Peaks isn’t THAT dense; most of it makes sense as you watch. But not all of it. And even things you think you understand sometimes come back to mean something different once you’ve had time to let it all sink in. That’s a richer, and far more active, experience than just about anything else on television, and Fargo can’t quite match that. That is Dougie Jones. Or rather, it’s Dale Cooper, newly-released from the Black Lodge and so addled by his 25 years of imprisonment that his mind is a blank slate. He’s shuffling around like a newborn baby, completely unfamiliar with how the world works and unable to do much else other than copy other people’s actions and words. Because of that, he believes that he’s Dougie Jones, a third Coop look-a-like apparently created out of whole cloth by the doppelganger as a trap. There’s some absurdist comedy to be had out of Cooper stumbling through Dougie’s life while no one who knew Dougie notices that he’s suddenly behaving like a stroke victim. Kyle McLachlan is great in the role, bringing humor and pathos to the situation. And, slowly, it’s coming together. The various strands of Dougie plot are being revealed, and things that seemed like inexplicable jokes at the outset are starting to make sense. There’s a pay-off coming, and I’m starting to look forward to seeing what it’s going to be. But it’s taken four hours to get here, and along the way I found much of the Dougie stuff insufferable. But that’s David Lynch. He loves his long takes and his slow, deliberate examination. He is a master of the long, awkward situation, and he is in no hurry at all to get through anything. Which is great once he’s done with it. But along the way… Yikes. Sometimes, I just want to kill him. That’s not a reaction I ever have to Noah Hawley on Fargo. His work’s more satisfying on an episode-to-episode basis. It’s smart and funny and surprising. It doesn’t haunt me the way Twin Peaks does, but it offers clever writing and visceral thrills that engage me immediately, every week. And, brother, let me tell you… If I thought this season was a slow burn, it’s moving at light speed in comparison to Twin Peaks. So this experience has taught me patience. Twin Peaks reminded me to slow down, and watch, and think. Which made Fargo click. And having Fargo click the way it did gave me faith that the parts of Twin Peaks I was getting frustrated with might come together in the end. If I was able to just sit back and enjoy the ride.